And in that silence we the tempest fear." In this year he was elected a fellow of the royal society, a circumstance which appears to have escaped the notice of most of his biographers. Dr. Birch mentions it in his History of the Royal Society. | the year of wonders, 1666; an historical poem: printed in 1667. His reputation as a poet was now so well established, that this, together with his attachment to the court, procured him the place of poet-laureat, and historiographer to Charles II. of which accordingly he took possession, upon the death of sir William Davenant, in 1668, but his patent was not signed till 1670. The pension of the two offices was 200l. a year. In 1667 he published “An Essay on Dramatic Poesy,” dedicated to Charles earl of Dorset and Middlesex. In the preface we are told that the purpose of this discourse was to vindicate the honour of our English writers from the censure of those who unjustly prefer the French. The essay is drawn up in the form of a dialogue. 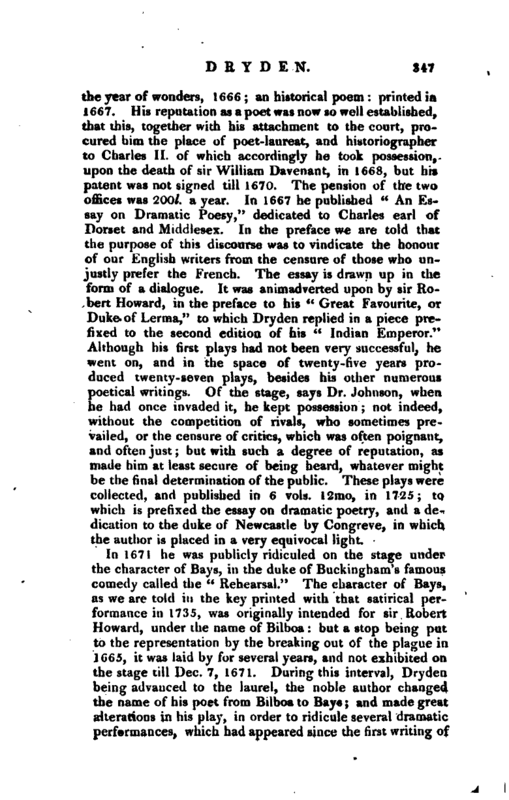 It was animadverted upon by sir Robert Howard, in the preface to his “Great Favourite, or Duke of Lerma,” to which Dryden replied in a piece prefixed to the second edition of his “Indian Emperor.” Although his first plays had not been very successful, he went on, and in the space of twenty-five years produced twenty-seven plays, besides his other numerous poetical writings. Of the stage, says Dr. Johnson, when he had once invaded it, he kept possession; not indeed, without the competition of rivals, who sometimes prevailed, or the censure of critics, which was often poignant, and often just; but with such a degree of reputation, as made him at least secure of being heard, whatever might be the final determination of the public. These plays were collected, and published in 6 vols. 12mo, in 1725; to which is prefixed the essay on dramatic poetry, and a dedication to the duke of Newcastle by Congreve, in which the author is placed in a very equivocal light. * Dr. Johnson has taken particular some solace to the consciousness of notice of Dryden’s controversy with weakness, and some mortification to Settle. As Dryden’s pamphlet has the pride of wisdom. But let it be reliever been thought worihy of repub- membered, that minds are not levelled lii’ilion, and is not easily to he found, in their powers but when they are first the doctor has endeavoured to gratify levelled in their desires. 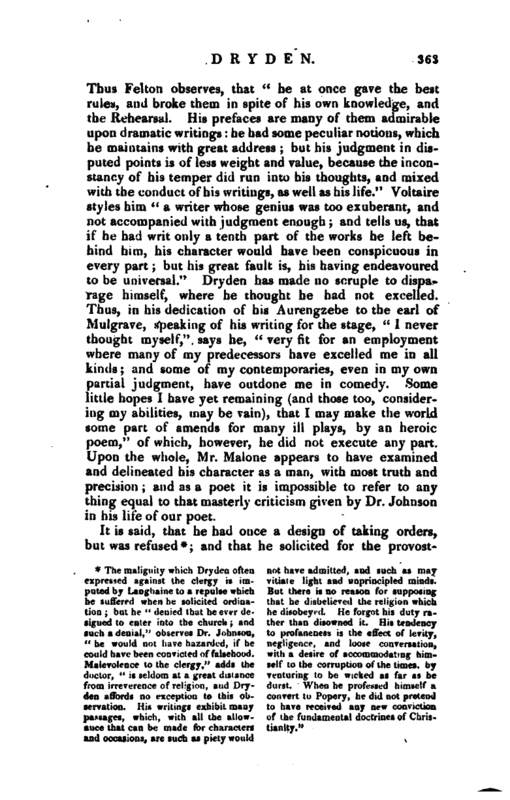 Dryden and the curiosity of his readers, by giving Settle had both placed their hapt large extracts from it larger, perhaps, in the claps of multitudes.“Klkanah than the performance merited, but his Settle’s tragedy, entitled” The i. inconcluding remark is admirable press ofMorocco,’‘ which v. "Such was the criticism to which the in rhyme, and for a while was mucli enius of Dryden could be reduced be- applauded, is said to have been the tween rage and terror; rage with little first play embellished with sculpture*, provocation, and terror with little dan- Even this circumstance stem- ’<> ger. To see the highest minds thus given poor Dryden great disturbs levelled with the meanest may produce | severe reflections on the duchess of Portsmouth and the earl of Rochester; and they, suspecting Dryden to be the author of it, hired three men to cudgel him; who, as Wood relates, effected their business as he was returning from Will’s coffee-house through Rose-street, Covent-gardeu, to his own house in Gerrard-street, Soho, at eight o’clock at night, on the 16th of December, 1679. In 1680 came out an English translation in verse of Ovid’s epistles by several hands two of which, viz. 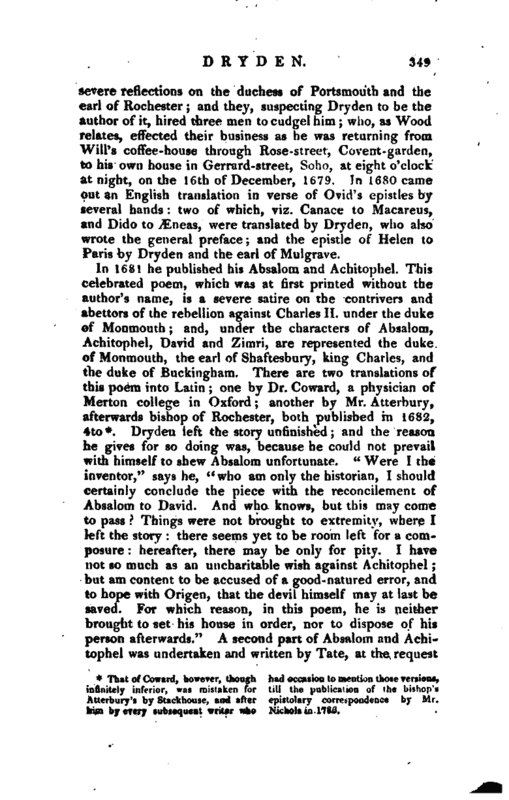 Canace to Macareus, and Dido to Æneas, were translated by Dryden, who also wrote the general preface and the epistle of Helen to Paris by Dryden and the earl of Mulgrave. That of Coward, however, though infinitely inferior, was mistaken for Atterbury’s by Stackhouse, and after him by every subsequent writer who had occasion to mention those versions, till the publication of the bishop’s epistolary correspondence by Mr, Nichols in 1786. 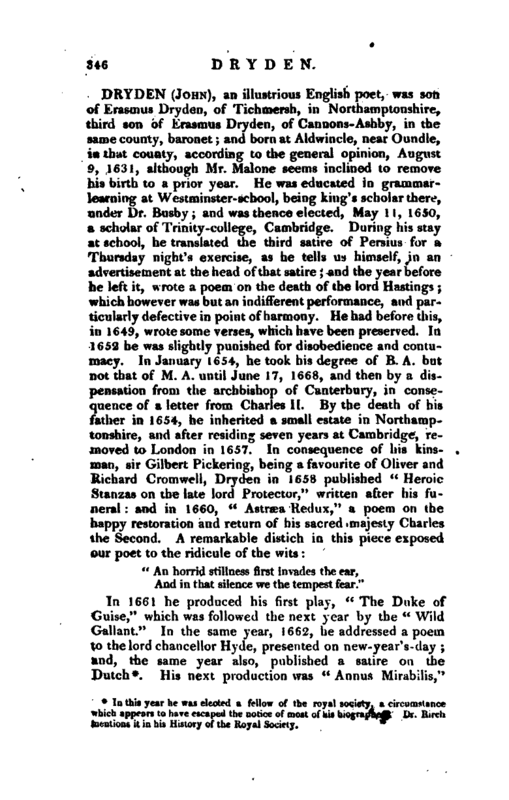 | and under the direction of Dryden, who wrote near 200 lines of it himself. The same year, 1681, he published his Medal, a satire against sedition. This poem was occasioned by the striking of a medal, on account of the indictment against the earl of Shaftesbury for high-treason being found ignoramus by the grand jury at the Old Bailey, November 1611, for which the whig-party made great rejoicings by ringing of bells, bonfires, &c. in all parts of London. 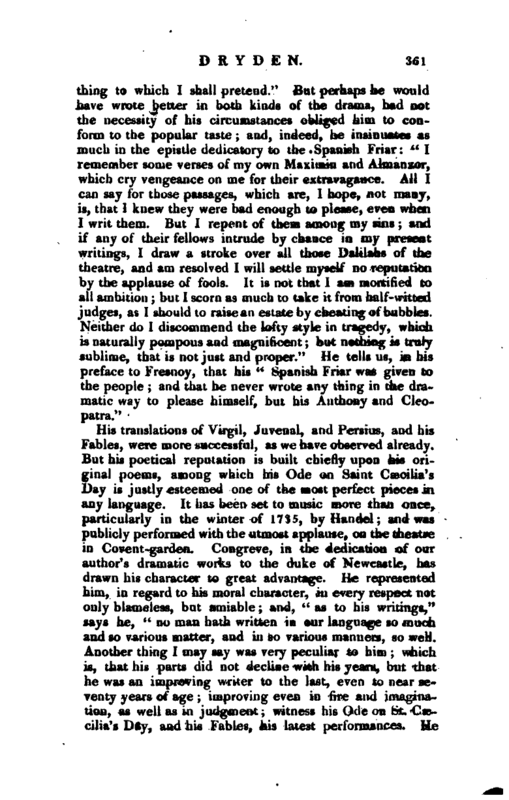 The whole poem is a severe invective against the earl of Shaftesbury and the whigs to whom the author addresses himself, ina satirical epistle prefixed to it, thus “I have one favour to desire of you at parting, that, when you think of answering this poem, you would employ the same pens against it, who have combated with so much success against Absalom and Achitophel; for then you may assure yourselves of a clear victory without the least reply. Rail at me abundantly; and, not to break a custom, do it without wit. If God has not blessed you with the talent of rhyming, make use of my poor stock and welcome: let your verses run upon my feet; and for the utmost refuge of notorious blockheads, reduced to the last extremity of sense, turn my own lines upon me, and, in utter despair of your own satire, make me satirize myself.” Settle wrote an answer to this poem, entitled “The Medal reversed;” and is erroneously said to have written a poem called “Azariah and Hushal,” against “Absalom and Achitophel.” This last was the production of one Pordage, a dramatic writer. In 1682, Dryden published a poem, called “Religio Laici; or, the Layman’s Faith.” This piece is intended as a defence of revealed religion, and of the excellency and authority of the scriptures, as the only rule of faith and manners, against deists, papists, and presbyterians. 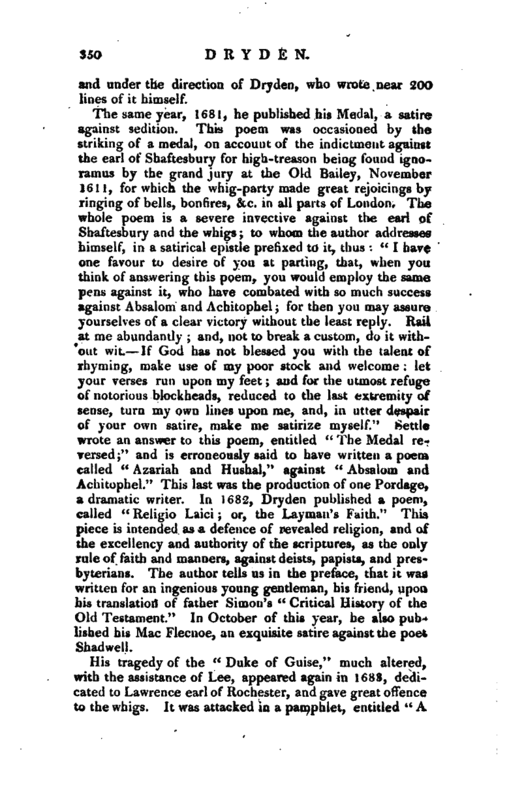 The author tells us in the preface, that it was written for an ingenious young gentleman, his friend, upon his translation of father Simon’s “Critical History of the Old Testament.” In October of this year, he also published his Mac Flecnoe, an exquisite satire against the poet Shad well. His tragedy of the “Duke of Guise,” much altered, with the assistance of Lee, appeared again in 168S, dedicated to Lawrence earl of Rochester, and gave great offence to the whigs. It was attacked in a pamphlet, entitled “A | Defence of the charter and municipal rights of the city of London, and the rights of other municipal cities and towns of England. Directed to the citizens of London. By Thomas Hunt.” In this piece, Dryden is charged with condemning the charter of the city of London, and executing its magistrates in effigy, in his “Duke of Guise;” frequently acted and applauded, says Hunt, and intended most certainly to provoke the rahhle into tumults and disorders. 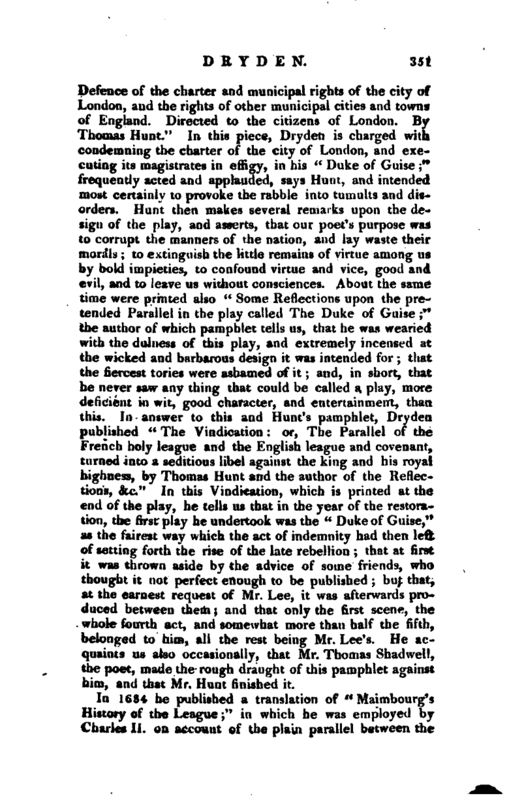 Hunt then makes several remarks upon the design of the play, and asserts, that our poet’s purpose was to corrupt the manners of the nation, and lay waste their morals; to extinguish the little remains of virtue among us by bold impieties, to confound virtue and vice, good and evil, and to leave us without consciences. About the same time were printed also “Some Reflections upon the pretended Parallel in the play called The Duke of Guise” the author of which pamphlet tells us, that he was wearied with the dulness of this play, and extremely incensed at the wicked and barbarous design it was intended for; that the fiercest tories were ashamed of it; and, in short, that he never saw any thing that could be called a play, more deficient in wit, good character, and entertainment, than this. 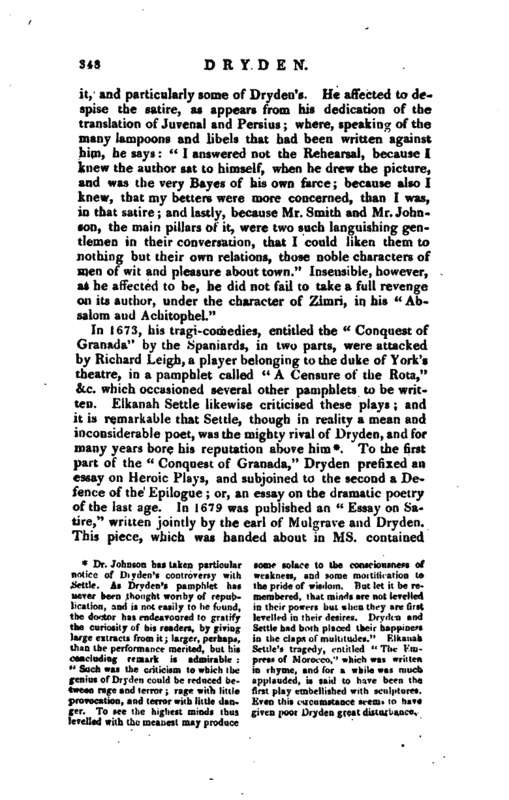 In answer to this and Hunt’s pamphlet, Dryden published “The Vindication: or, The Parallel of the French holy league and the English league and covenant, turned into a seditious libel against the king and his royal highness, by Thomas Hunt and the author of the Reflections, &c.” In this Vindication, which is printed at the end of the play, he tells us that in the year of the restoration, the first play he undertook was the “Duke of Guise,” as the fairest way which the act of indemnity had then left of setting forth the rise of the late rebellion; that at first it was thrown aside by the advice of some friends, who thought it not perfect enough to be published; but that, at the earnest request of Mr. Lee, it was afterwards produced between them; and that only the first scene, the whole fourth act, and somewhat more than half the fifth, belonged to him, all the rest being Mr. Lee’s. He acquaints us also occasionally, that Mr. Thomas Shadwell, the poet, made the rough draught of this pamphlet against him, and that Mr. Hunt finished it. In 1684 he published a translation of “Maimbonrg’s History of the League” in which he was employed by Charles II. on account of the pla’ui parallel between the | troubles of France and those of Great Britain. Upon the death of this monarch, he wrote his “Threnodia Augustalis:” a poem sacred to the happy memory of that prince. Soon after the accession of James II. 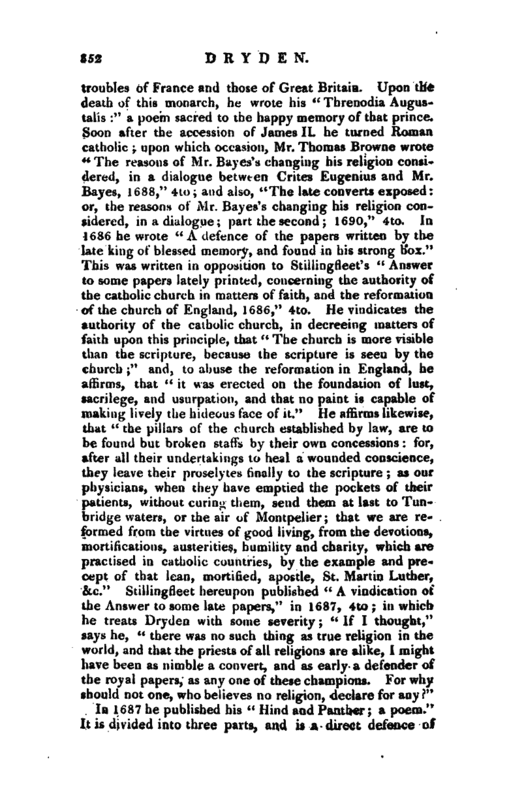 he turned Roman catholic upon which occasion, Mr. Thomas Browne wrote “The reasons of Mr. Bayes’s changing his religion considered, in a dialogue between Crites Eugenius and Mr. Bayes, 1688,” 4to; and also, “The late converts exposed: or, the reasons of Mr. Bayes’s changing his religion considered, in a dialogue; part the second 1690,” 4to. In 1686 he wrote “A defence of the papers written by the late king of blessed memory, and found in his strong box.” This was written in opposition to Stillingfleet’s “Answer to some papers lately printed, concerning the authority of the catholic church in matters of faith, and the reformation of the church of England, 1686,” 4to. He vindicates the authority of the catholic church, in decreeing matters of faith upon this principle, that “The church is more visible than the scripture, because the scripture is seen by the church;” and, to abuse the reformation in England, he affirms, that “it was erected on the foundation of lust, sacrilege, and usurpation, and that no paint is capable of making lively the hideous face of it.” He affirms likewise, that “the pillars of the church established by law, are to be found but broken staffs by their own concessions: for, after all their undertakings to heal a wounded conscience, they leave their proselytes finally to the scripture; as our physicians, when they have emptied the pockets of their patients, without curing them, send them at last to Tunbridge waters, or the air of Montpelier; that we are reformed from the virtues of good living, from the devotions, mortifications, austerities, humility and charity, which are practised in catholic countries, by the example and precept of that lean, mortified, apostle, St. Martin Luther, &c.” Stillingrleet hereupon published “A vindication of the Answer to some late papers,” in 1687, 4to; in which he treats Dryden with some severity; “If I thought,” says he, “there was no such thing as true religion in the world, and that the priests of all religions are alike, I might have been as nimble a convert, and as early a defender of the royal papers, as any one of these champions. For why should not one, who believes no religion, declare for any?” In 1687 he published his “Hind and Panther; a poem.” It is divided into three parts, and is a direct defence of | the Romish church, chiefly by way of dialogue between a hind, who represents the church of Rome, and a panther, who sustains the character of the church of England. These two beasts very learnedly discuss the several points controverted between the two churches; as transubstantiation, church-authority, infallibility, &c. In the preface he tells us, that this poem “was neither imposed on him, nor so much as the subject given han by any man. It was written,” says he, “durin;- the last winter and the beginning of this spring, though with long interruptions of ill health and other hindrances. About a fortnight before I had finished it, his majesty’s declaration for liberty of conscience came abroad which it 1 had so soon expected, I might have spared myself the labour of writing many things, which are contained in the third part of it. But 1 was always in some hope the church of England might have been persuaded to have taken off the penal laws and the test, which was one design of the poem when I proposed to myself the writing of it.” This poem was immediately attacked by the wits, particularly by Montague (afterwards earl of Halifax,) and Prior; who joined in writing ‘ The Hind and Panther transversed to the story of the Country Mouse and the City Mouse.“In 1688 he published” Britannia Rediviva;" a poem on the birth of the prince. He was supposed, some time before this, to have been engaged in translating Varillas’s History of Heresies, but to have dropped that work before it was finished. 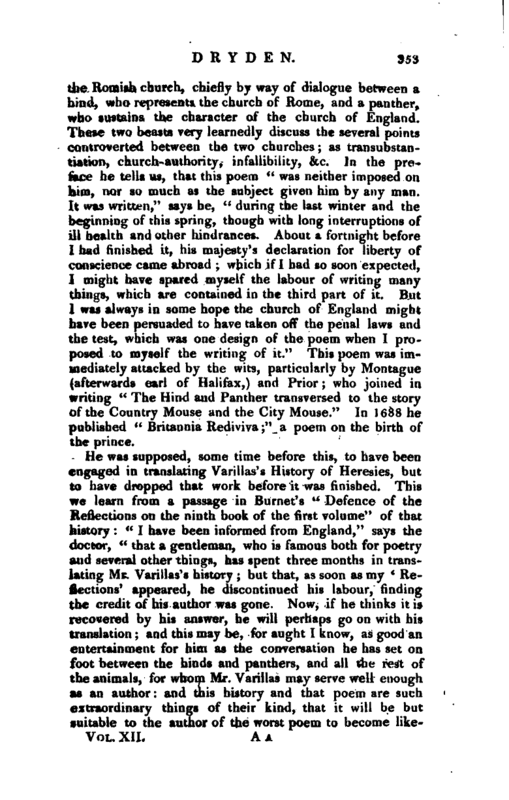 This we learn from a passage in Burnet’s “Defence of the Reflections on the ninth book of the first volume” of that history: “I have been informed from England,” says the doctor, “that a gentleman, who is famous both for poetry and several other things, has spent three months in translating Mr. Varillas’s history; but that, as soon as my * Reflections’ appeared, he discontinued his labour, finding the credit of his author was gone. Now, if he thinks it is recovered by his answer, he will perhaps go on with his translation; and this may be, for aught I know, as good an entertainment for him as the conversation he has set on foot between the hinds and panthers, and all the rest of the animals, for whom Mr. Varillas may serve well enough, as an author and this history and that poem are sucb> extraordinary things of their kind, that it will be but suitable to the author of the worst poem to become | likwise the translator of the worst history that the age has produced. If his grace and his wit improve both proportional)] y, we shall hardly find that he has gained much by the change he has made, from having no religion to choose one of the worst. It is true, he had somewhat to sink from in matter of wit; but as for his morals, it is scarce possible for him to grow a worse man than he was. He has lately wreaked his malice on me for spoiling his three months labour; but in it he has done me all the honour that any man can receive from him, which is, to be railed at by him. If I had ill nature enough to prompt me to wish a very bad wish for him, it should be, that he would go on and finish his translation. By that it will appear, whether the English nation, which is the most competent judge in this matter, has, upon the seeing our debate, pronounced in Mr. Varilias’s favour or mine. 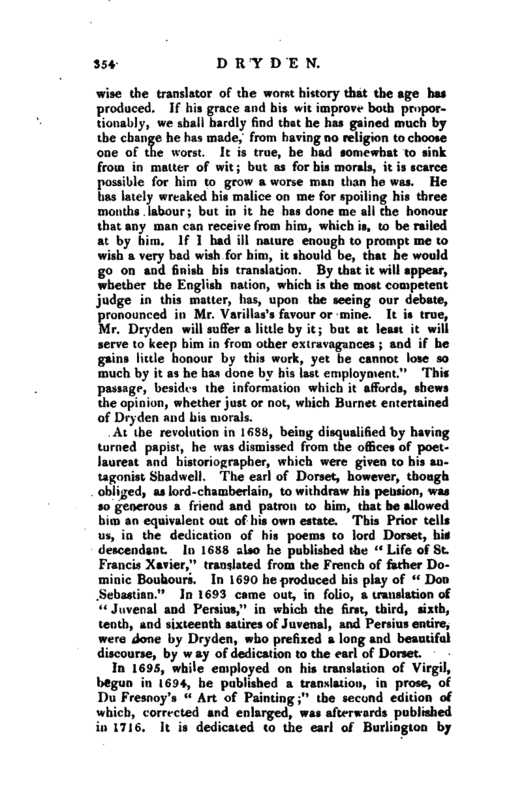 It is true, Mr. Dryden will suffer a little by it but at least it will serve to keep him in from other extravagances and if he gains little honour by this work, yet he cannot lose so much by it as he has done by his last employment.” This passage, besides the information which it affords, shews the opinion, whether just or not, which Burnet entertained of Dryden and his morals. At the revolution in 1688, being disqualified by having turned papist, he was dismissed from the offices of poetlaureat and historiographer, which were given to his antagonist Shadwell. The earl of Dorset, however, though obliged, as lord-chamberlain, to withdraw his pension, was so generous a friend and patron to him, that he allowed him an equivalent out of his own estate. This Prior tells us, in the dedication of his poems to lord Dorset, his descendant. In 1688 also he published the “Life of St. Francis Xavier,” translated from the French of father Dominic Bouhours. In 1690 he produced his play of “Don Sebastian.” In 1693 came out, in folio, a translation of “Juvenal and Persius,” in which the first, third, sixth, tenth, and sixteenth satires of Juvenal, and Persius entire, were done by Dryden, who prefixed a long and beautiful discourse, by way of dedication to the earl of Dorset. In 1695, while employed on his translation of Virgil, begun in 1694, he published a translation, in prose, of Dr. Fresnoy’s “Art of Painting;” the second edition of which, corrected and enlarged, was afterwards published in 1716. It is dedicated to the earl of Burlington by | Richard Graham, esq. 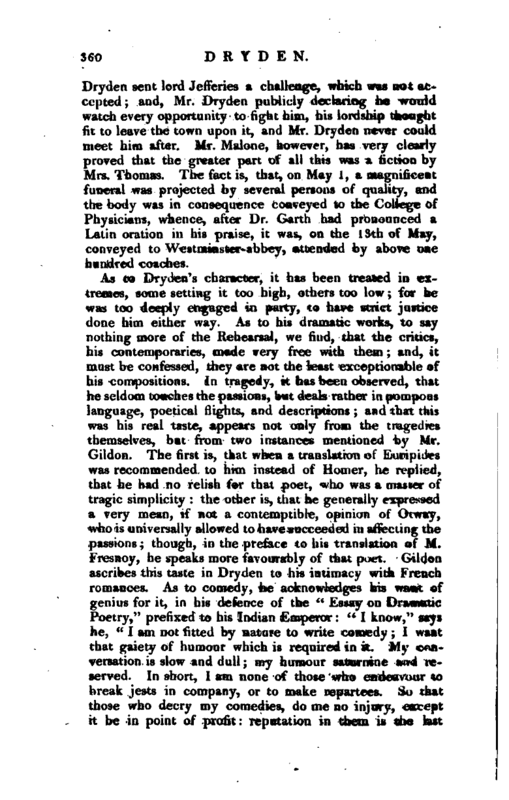 who observes in the dedication, that some liberties have been taken with this excellent translation, of which he gives the following account: “The misfortune that attended Mr. Dryden in that undertaking was, that, for want of a competent knowledge in painting, he suffered himself to be misled by an unskilful guide. Monsieur de Piles told him, that his French version was made at the request of the author himself; and altered by him, till it was wholly to his mind. This Mr. Dryden taking upon content, thought there was nothing more incumbent upon him than to put it into the best English he could, and accordingly performed his part here, as in every thing else, with accuracy. 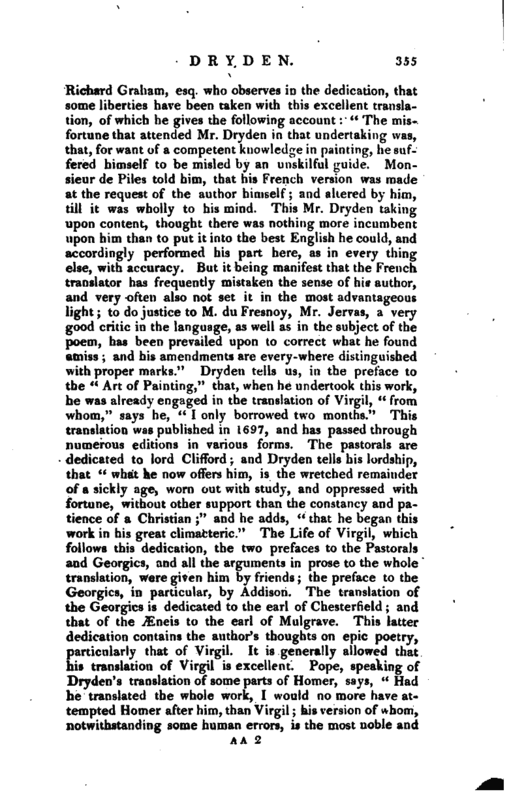 But it being manifest that the French translator has frequently mistaken the sense of his author, and very often also not set it in the most advantageous light; to do justice to M. du Fresnoy, Mr. Jervas, a very good critic in the language, as well as in the subject of the poem, has been prevailed upon to correct what he found amiss; and his amendments are every-where distinguished uith proper marks.” Dryden tells us, in the preface to the “Art of Painting,” that, when he undertook this work, he was already engaged in the translation of Virgil, “from whom,” says he, “I only borrowed two months.” This translation was published in 1697, and has passed through numerous editions in various forms. The pastorals are dedicated to lord Clifford; and Dryden tells his lordship, that “what he now offers him, is the wretched remainder of a sickly age, worn out with study, and oppressed with fortune, without other support than the constancy and patience of a Christian;” and he adds, “that he began this work in his great climacteric.” The Life of Virgil, which follows this dedication, the two prefaces to the Pastorals and Georgics, and all the arguments in prose to the whole translation, were given him by friends; the preface to the Georgics, in particular, by Addison. The translation of the Georgics is dedicated to the earl of Chesterfield; and that of the ^neis to the earl of Mulgrave. This latter dedication contains the author’s thoughts on epic poetry, particularly that of Virgil. It is generally allowed that his translation of Virgil is excellent. 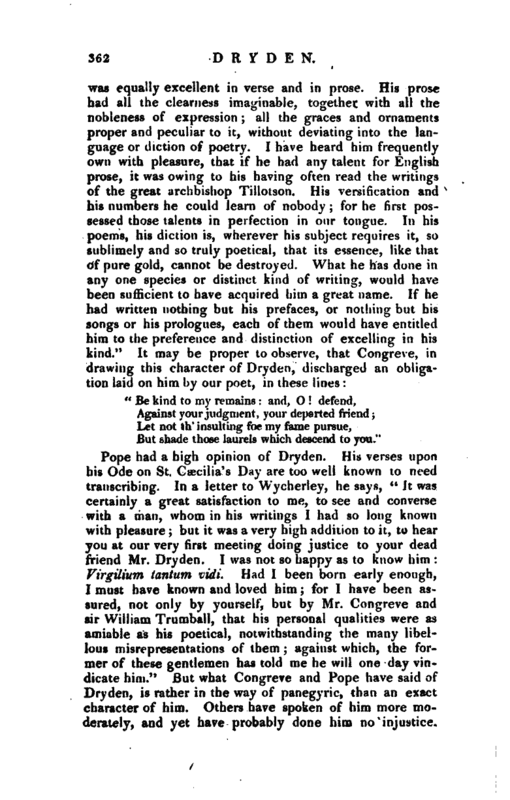 Pope, speaking of Dryden’s translation of some parts of Homer, says, “Had he translated the whole work, I would no more have attempted Homer after him, than Virgil; his version of whom, notwithstanding some human errors, is the most noble and | spirited translation I know in any language.” In the same year he published his celebrated ode of “Alexander’s Feast,” which is commonly said to have been finished in one night; but, according to Mr. Malone, occupied him for some weeks. In 1699 he entered into a contract with Tonson, the bookseller, to supply him with 10,000 verses, which produced in 1700 his “Fables, ancient and modern;” translated into verse from Homer, Ovid, Boccace, and Chaucer. He tells us in the preface to this his last work, that “he thinks himself as vigorous as ever in the faculties of his soul, excepting only his memory, which,” he says, “is not impaired to any great degree;” and he was then sixtyeight years of age. For this labour he was to get only 30GJ. out of which 250 guineas were paid down, and he was to receive the remainder on the appearance of a second edition, which did not happen till thirteen years after his death. Besides the original pieces and translations hitherto mentioned, he wrote many other things, which have been several times published in the “Six volumes of Miscellanies” under his name, and in other collections. They consist of translations from the Greek and Latin poets epistles to several persons; prologues and epilogues to various plays elegies, epitaphs, and songs. In 1743 came out in two volumes 12mo, a new collection of our author’s poetical works, under the title of “Original Poems and Translations, by John Dry den, esq. now first collected and published together;” that is, collected from the “Six volumes of Miscellanies” just mentioned. 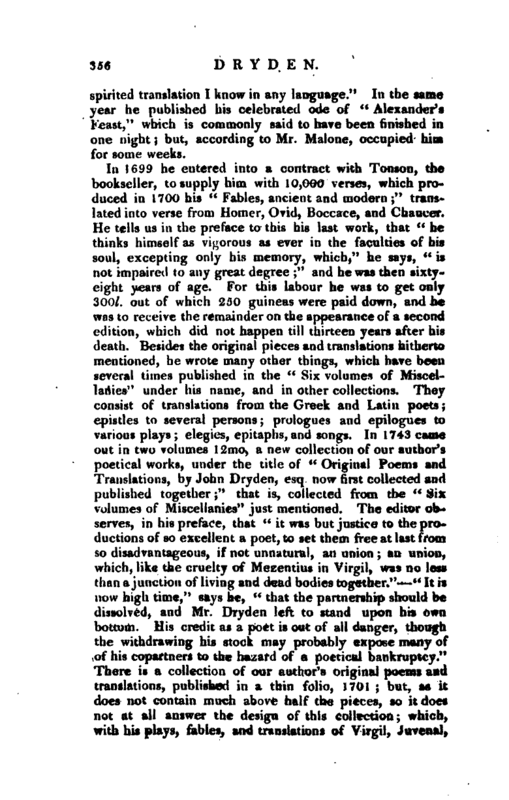 The editor observes, in his preface, that “it was but justice to the productions of so excellent a poet, to set them free at last from so disadvantageous, if not unnatural, an union; an union, which, like the cruelty of Mezentius in Virgil, was no less than a junction of living and dead bodies together.” “It is now high time,” says he, “that the partnership should be dissolved, and Mr. Dryden left to stand upon his own bottom. His credit as a poet is out of all danger, though the withdrawing his stock may probably expose many of of his copartners to the hazard of a poetical bankruptcy.” There is a collection of our author’s original poems and translations, published in a thin folio, 1701; but, as it does not contain much above half the pieces, so it does not at all answer the design of this collection; which, with his plays, fables, and translations of Virgil, JuvenaJ, | and Persius, was intended to complete his works in twelves. As to his performances in prose, besides essays and prefaces, some of which have been mentioned, he wrote the lives of Plutarch anci Lucian, prefixed to the translations of those authors by several hands; “The Life of Polybius,” before the translation of that historian by sir Henry Sheer; and the preface to the “Dialogue concerning Women,” by William Walsh, esq. He had for some years been harassed by the gravel and the gout; and in December, 1699, was afflicted with an erysipelas in one of his legs. Having recovered, however, from that disorder, he was sufficiently free from any complaint to apply again to his studies; but he was confined to his house by the gout during the greater part of March and April; and near the end of that month, in consequence of neglecting an inflammation in one of his feet, a mortification ensued, of which he died, after a very short illness, at three o’clock on Wednesday morning, May the 1st, 1700. Dr. Johnson conceived, that no description of Dryden’s person had been transmitted to us but, on the contrary, there are few English poets, of whose external appearance more particulars have been recorded. We have not indeed any original whole-length portrait of him, such as | that very curious delineation of Pope, with which we have been lately gratified, whence a more perfect notion of that poet’s external appearance may be obtained than from all the friendly drawings of Richardson; yet from various descriptions of Dryden’s person that have come down to us, a very adequate idea of it may be formed. He was certainly a short, fat, florid man, “corpore quadrato,” as lord Hailes some years ago observed to Mr. Malone, “a description which ^neas Sylvius applied to James the First of Scotland” The same gentleman remarked, that that at one time he wore his hair in large quantity, and that it inclined to gray, even before his misfortunes; a circumstance which, he said, he had learned from a portrait of Dry den, painted by Kneller, formerly in the possession of the late Mr. James West. But perhaps his lordship here is not quite accurate. By “before his misfortunes” was meant before the Revolution; but the portrait in question was probably painted at a later period. From other documents, however, it appears that he became gray before he was deprived of the laurel. In Riley’s portrait, painted in 1683, he wears a very large wig: so also in that by Closterman, done at a late period. 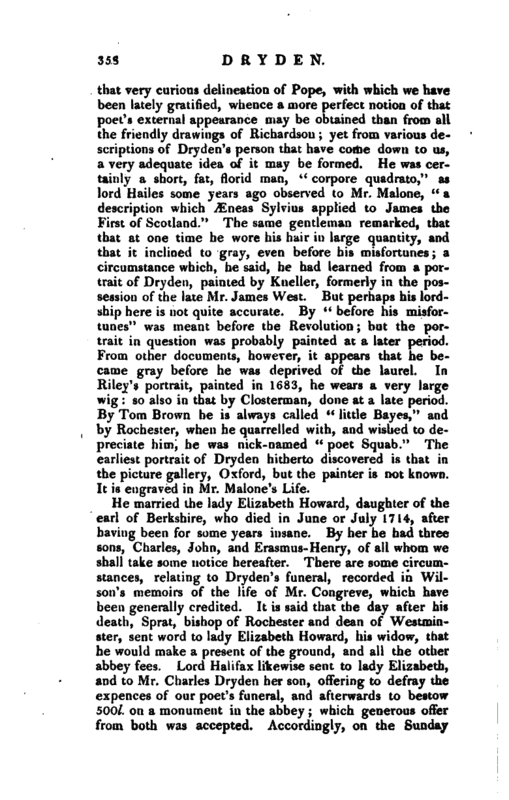 By Tom Brown he is always called “little Bayes,” and by Rochester, when he quarrelled with, and wished to depreciate him, he was nick-named “poet Squab.” The earliest portrait of Dryden hitherto discovered is that in the picture gallery, Oxford, but the painter is not known. It is engraved in Mr. Malone’s Life. He married the lady Elizabeth Howard, daughter of the earl of Berkshire, who died in June or July 1714, after having been for some years insane. By her he had three sons, Charles, John, and Erasmus—Henry, of all whom we shall take some notice hereafter. 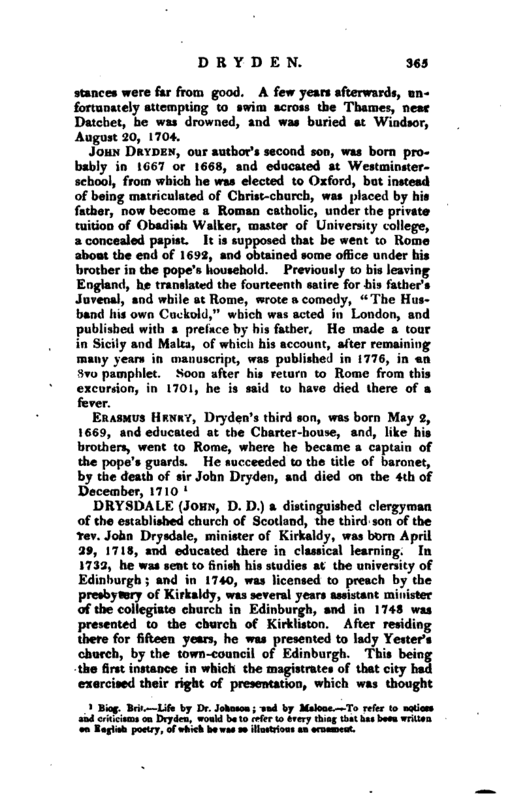 There are some circumstances, relating to Dryden’s funeral, recorded in Wilson’s memoirs of the life of Mr. Congreve, which have been generally credited. It is said that the day after his death. Sprat, bishop of Rochester and dean of Westminster, sent word to lady Elizabeth Howard, his widow, that he would make a present of the ground, and all the other abbey fees. Lord Halifax likewise sent to lady Elizabeth, and to Mr. Charles Dryden her son, offering to defray the expences of our poet’s funeral, and afterwards to bestow 500l. on a monument in the abbey; which generous offer from both was accepted. Accordingly, on the Sunday | following, the company being assembled, the corpse was put into a velvet hearse, attended by 18 mourning coaches, When they were just ready to move, lord Jefferu-s, son of the chancellor Jefferies, with some of his rakish companions, coining by, asked whose funeral it was; and, being told it was Mr. Dry den’s, he protested, that ho should not be buried in that private manner; that he would himself, with lady Elizabeth’s leave, have the honour of his interment, and would bestow 1000l. on a monument in the abbey for him. This put a stop to the procession; and Jefferies, with several of the gentlemen who had alighted from the coaches, went up stairs to the lady Elizabeth, who was sick in bed. Jefferies repeated the purport of what he had said below; but lady Elizabeth absolutely refusing her consent, he fell on his knees, vowii.g never to rise till his request was granted. The lady, under a sudden surprise, fainted away and lord Jefferies, pretending to have gained her consent, ordered the body to be carried to Mr. RussePs, an undertaker in Cheapside, and to be left there till further orders. In the mean time, the abbey was lighted up, the ground opened, the choir attending, and the bishop waiting some hours to no purpose for the corpse. The next day, Mr. Charles Dryden waited upon lord Halifax and the bishop, and endeavoured to excuse his mother, by relating the truth; but they would not hear of any excuse. Three days after, the undertaker, receiving no orders, waited on lord Jetieries, who turned it off in a jest, pretending, that those who paid any regard to a drunken frolic deserved no better; that he remembered nothing at all of the matter; and that they might do what they pleased with the corpse. Upon this, the undertaker waited on the lady Elizabeth, who desired a day to consider what must be done. Mr. Charles Dryden immediately wrote to lord Jefferies, who returned for answer, that he knew nothing of the matter, and would be troubled no more about it. Mr. Dryden applied again to lord Halifax and the bishop of Rochester, who absolutely refused to do any thing in the affair. 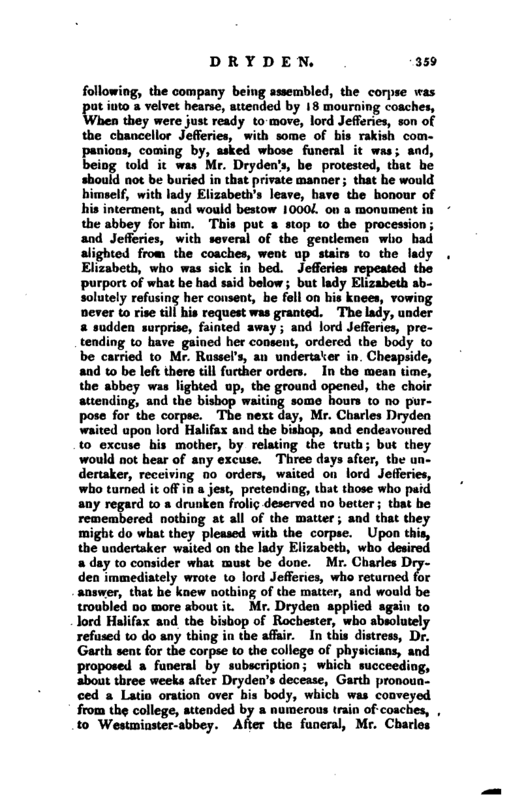 In this distress, Dr. Garth sent for the corpse to the college of physicians, and proposed a funeral by subscription which succeeding, about three weeks after Dryden’s decease, Garth pronounced a Latin oration over his body, which was conveyed from the college, attended by a numerous train of coaches, to Westminster-abbey. After the funeral, Mr. Charles | Dryden sent lord Jefteries a challenge, which was not accepted; and, Mr. Dryden publicly declaring he would watch every opportunity to fight him, his lordship thought fit to leave the town upon it, and Mr. Dryden never could meet him after. Mr. Malone, however, has very clearly proved that the greater part of all this was a fiction by Mrs. Thomas. The fact is, that, on May 1, a magnificent funeral was projected by several persons of quality, and the body was in consequence conveyed to the College of Physicians, whence, after Dr. Garth had pronounced a Latin oration in his praise, it was, on the 13th of May, conveyed to Westminster-abbey, attended by above one hundred coaches. But shade those laurels which descend to you." Pope had a high opinion of Dryden. His verses upon his Ode on St. Caecilia’s Day are too well known to need transcribing. 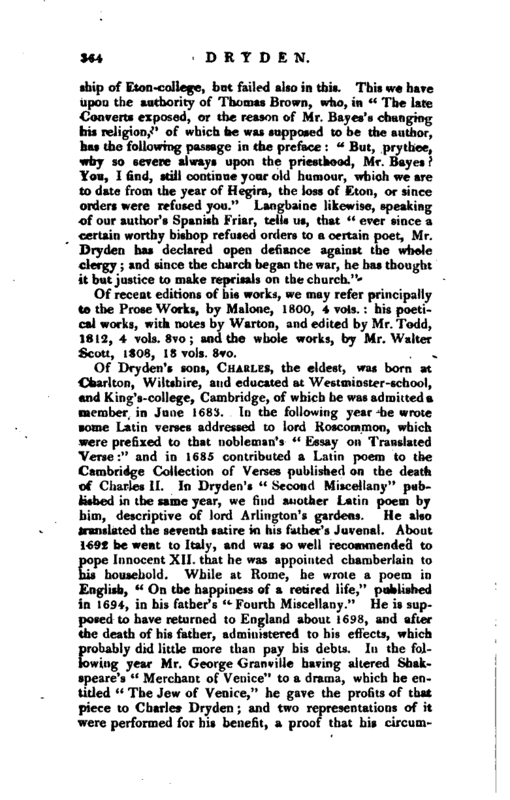 In a letter to Wycherley, he says, “It was certainly a great satisfaction to me, to see and converse with a man, whom in his writings I had so long known with pleasure; but it was a very high addition to it, to hear you at our very first meeting doing justice to your dead friend Mr. Dryden. I was not so happy as to know him: Frrgtlium tantum vidi. Had I been born early enough, I must have known and loved him; for I have been assured, not only by yourself, but by Mr. Congreve and sir William Trumball, that his personal qualities were as amiable as his poetical, notwithstanding the many libellous misrepresentations of them; against which, the former of these gentlemen has told me he will one day vindicate him.” But what Congreve and Pope have said of Dryden, is rather in the way of panegyric, than an exact character of him. Others have spoken of him more moderately, and yet have probably done him no injustice. | Thus Felton observes, th^.t “he at once gave the best rules, and broke them in spite of his own knowledge, and the Rehearsal. His prefaces are many of them admirable upon dramatic writings: he had some peculiar notions, which he maintains with great address; but his judgment in disputed points is of less weight and value, because the inconstancy of his temper did run into his thoughts, and mixed with the conduct of his writings, as well as his life.” Voltaire styles him “a writer whose genius was too exuberant, and not accompanied with judgment enough; and tells us, that if he had writ only a tenth part of the works he left behind him, his character would have been conspicuous in every part; but his groat fault is, his having endeavoured to be universal.” Dryden has made no scruple to disparage himself, where he thought he had not excelled. Thus, in his dedication of his Aurengzebe to the earl of Mulgrave, speaking of his writing for the stage, “I never thought myself,” says he, “very fit for an employment where many of my predecessors have excelled me in all kinds; and some of my contemporaries, even in my own partial judgment, have outdone me in comedy. Some little hopes I have yet remaining (and those too, considering my abilities, may be vain), that I may make the world some part of amends for many ill plays, by an heroic poem,” of which, however, he did not execute any part. Upon the whole, Mr. Malone appears to have examined and delineated his character as a man, with most truth and precision; and as a poet it is impossible to refer to any thing equal to that masterly criticism given by Dr. Johnson in his life of our poet. Of recent editions of his works, we may refer principally to the Prose Works, by Malone, 1800, 4 vols. : his poetical works, with notes by Warton, and edited by Mr. Totld, 1812, 4 vols. 8vo; and the whole works, by Mr. Walter Scott, 1808, 18 vols. 8vo.